first encountered the Benedictine sisters who came to teach catechism to the school children. With delight, Sister Ruth Margaret recounts that one of those sisters who taught her is still living and is a member of the Annunciation Monastery community. Since her decision to enter religious life, Sister Ruth Margaret has succeeded in living a full and active life in service to her community and others. Early in her ministerial role, her work involved making altar breads, sewing, and making coifs, which were part of the habit worn by the sisters at that time. Over the years, she has accumulated a wealth of experience, and has at times served in a supervisory capacity, in areas which include laundry, housekeeping, charge of guests, central supply, yard work, dishwashing and food service, cooking, driving and errands, and charge of switchboard. 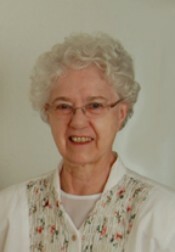 Additionally, she has served as a director for the work-study program for University of Mary students, as a laboratory aide and a physical therapy aide, and, at the San Raphael Mission in Tucson, Arizona, as a pastoral ministry and formation team leader. Currently, Sister Ruth Margaret continues to be of service by utilizing her years of ministerial experience in new and creative ways. She brings beauty and joy to the monastery environment by creating, arranging, caring for and placing gorgeous flower arrangements that make the monastery sing with color. She enjoys finding and placing cute, decorative, and sometimes whimsical knickknacks and colorful tablecloths on the dining room tables for special and holiday meals, and in strategic areas around the monastery where they will be most noticed and appreciated. Sister Ruth Margaret, constantly busy with both routine and special housekeeping tasks around the monastery, is the one others go to when they are challenged by a difficult cleaning task, or when they need to remove a stubborn stain or spot. She also helps to maintain “Bart’s Boutique,” a special little room at the monastery which serves as a clothing exchange for sisters. Part of this ministry includes ensuring distribution of donated items of clothing to charitable organizations and other institutions which serve the poor. Also, with her years of experience at switchboard, Sister Ruth Margaret is of great help to the community as she takes her turn at the front desk, taking phone calls and greeting guests. She enjoys sharing her knowledge of the ins-and-outs of reception work with newer or less experienced sisters, and is the one who has the phone plugged into her room at night, taking and fielding whatever after-hours or emergency calls may come in. Reflecting on her years as a sister, Sister Ruth Margaret notes how she has grown in faith, patience, and wisdom. She emphasizes the importance of doing the right things for the right reasons. “If you want what’s right, you’ll do what’s right in order to get it.” With compassion, she adds, “But it’s not always that easy for a person.” Sharing some important lessons she has learned through her years of observation and experience in community, she offers these words: “You cannot live another person’s lifestyle. Happiness and peace of heart have to come from within.” It is clear that Sister Ruth Margaret, with her years of utilizing her gifts, skills, abilities and experience to serve her community and others, exemplifies these wise words in all she is and does.